In response to animal rights protests, Blacktip Island’s Sons and Daughters of the Reef hunt club will substitute a local divemaster for a lionfish in their inaugural Mock Lionfish Cull for charity Saturday afternoon on the island’s west side. “More and more clubs worldwide are doing these mock hunts,” said S&DR Master-of-Fish Gage Hoase. “The prey, usually a fox, is replaced with a human, and the hunters still get a great chase. Club officers selected the local divemaster with the most customer complaints during the past year as the Designated Lionfish. “We’re sticking Lee Helm in a lionfish suit and dropping him on the reef,” S&DR Huntsperson-at-Arms Alison Diesel said. “We’ll give him five minutes, then turn the cullers loose with their spears. Local fish rights activists say the switch to human prey, while not a perfect solution, is a step in the right direction. Lionfish stand-in Lee Helm expressed reservations. Hunt club members say the vote for Helm was unanimous. Hunt organizers expect a record 35-40 cullers to participate. “There’re members with real grudges against Lee,” Hoase said. “We’ve warned everyone not to aim for exposed skin, but you never know what’ll happen in the heat of the hunt. We’ll have the nurse standing by. And lots of bandages. Proceeds from the hunt go to the Coral Reef Protection Fund. An illuminated panel from the Blacktip Codex shows Medieval islanders netting a lionfish. The scrawled figure at the lower left is believed to be the earliest representation of the island’s legendary mersquatch. 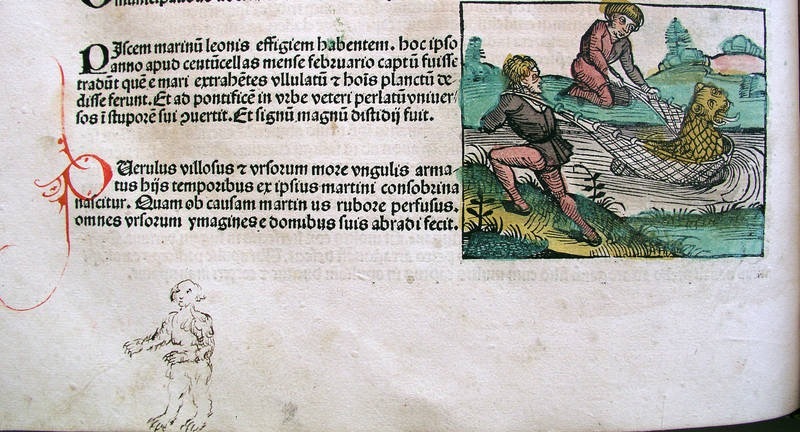 The discovery Thursday of a 600-year-old bound and illuminated religious text, dubbed the Blacktip Codex, sent shockwaves through the Caribbean island’s religious and academic communities. The rudimentary book, 200 pages of stacked sharkskin vellum bound on one edge, is attributed to St. Dervil of the Mead, patron saint of scuba diving and founder of the island’s Our Lady of Blacktip cathedral. The codex was discovered after heavy rains caused a cathedral wall and part of the flooring to collapse, revealing a previously unknown storage vault containing the codex, pots of coconut mead holy water, a cot, playing cards and other religious relics. Island historians say the book’s provenance speaks to its authenticity. “Blacktip Island was sacked by Norse raiders blown off course on their way to Greenland,” Tiperon University-Blacktip history professor Edwin Chub said. “This codex could have been placed in the underground vault for safekeeping. The island’s Ecumenical Council, however, has doubts. “It may date back to Dervil’s time, and maybe even Dervil’s hand,” council president and former Reverend Jerrod Ephesians said. “But some mead-sotted monk’s potboiler about Jesus’s descendants in the Caribbean? That’s not history. That’s a B-grade movie. Historians are also intrigued by the codex’s detailed illuminated panels. In addition to gold-leaf images of Mary and Sarah, the codex also shows island settlers nettling lionfish. Island merchants, meanwhile, are already capitalizing on the find. Some of the undocumented lionfish spears seized from Blacktip Island youngsters this week. The source of the spears has not been determined. Blacktip Islanders were shocked this week to find the Caribbean island’s Toys for Tots bins had been filled with pole spears normally used for lionfish culling. The situation was made worse by delinquents overturning the bins and stealing the spears. “Children raid the bins every year,” said retired Sgt. Maj. Beaugregory Damsil, who oversees the island’s Toys for Tots program. “The bins aren’t guarded, and the little scamps know toys are inside. Usually, the worst that happens is some tyke nicks a Tickle Me Elmo or something of the sort. 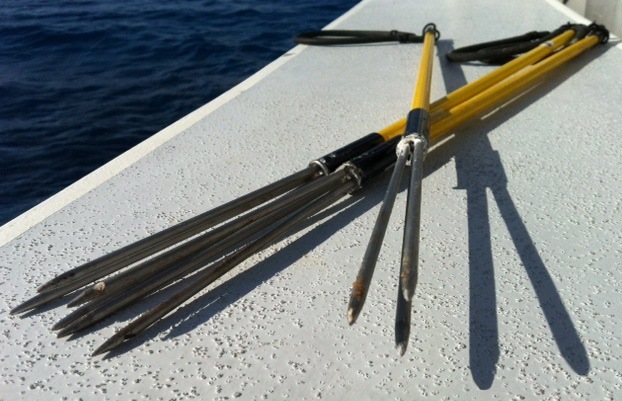 Island authorities are seizing the pole spears as they find them. “I corralled a bunch of kids today playing cullers-and-lionfish,” Island Police Constable Rafe Marquette said. “Had to take three ‘lionfish’ to the clinic for patching up. Fourteen spear-related injuries have been confirmed: 13 punctures, plus a skull fracture to a child blasted backwards after he speared an automobile tire. There are also unconfirmed reports of several punctured house cats. The situation has left many locals shaken. Island authorities would not comment on multiple reports of a man, wearing only a Santa coat and hat, lurking around toy collection centers earlier in the week, or that a small dog accompanying him may or may not have had a stick tied to its head. 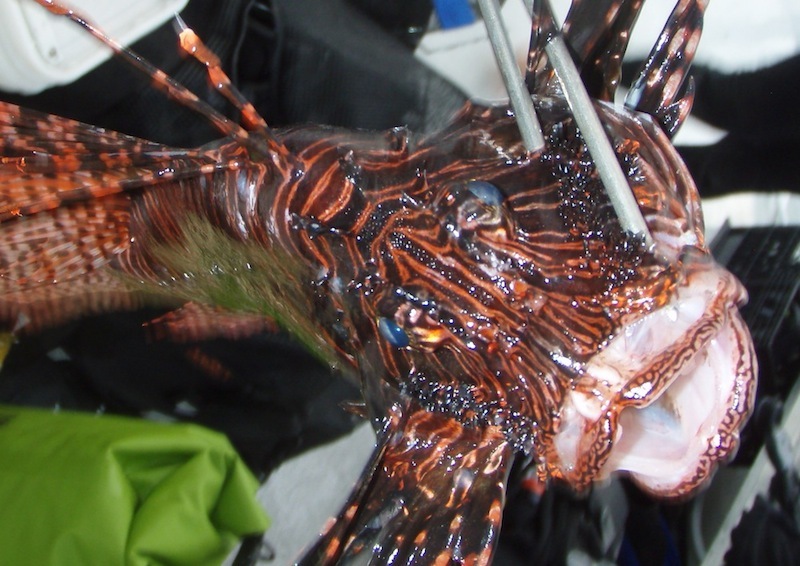 Red lionfish, native to the Indo-Pacific region, have overrun Caribbean reefs in the past decade. Cullers hope rifles will prove more efficient than spears. Blacktip Island’s Scuba Hunt Club will kick off lionfish season this weekend with an underwater safari along the Caribbean island’s west coast. Club members aim to cull as many of the non-native pests as possible with newly-developed underwater rifles. The Tiperon Islands Department of Natural Resources instituted the hunting season as part of the effort to eradicate the invasive Indo-Pacific fish devastating the islands’ reefs. The recent invention of an underwater lionfish rifle – a specially-adapted .308 caliber sealed for underwater use and chambered for an ultra-high velocity round to compensate for water’s density – has made this year’s safari possible. The rifles are fitted with underwater scopes that correct for light refraction at depth. “Spearing’s fun, sure,” said divemaster Gage Hoase. “But with the spears, you can only get a dozen or so before your air runs out. And the fish duck back in the coral where you can’t get them. The club hopes the safari concept will allow it to cleanse entire sections of the reef. “We’re using beaters and baggers to streamline the process,” B.C. Flote said. “Beaters’ll fan out over the reef, whacking their tank bangers to flush the lionfish from the tall sea grass, drive them into killing zones where the hunters can shoot them. The fish, not the beaters. Blacktip Island’s PETA chapter has filed a formal protest against the hunt.